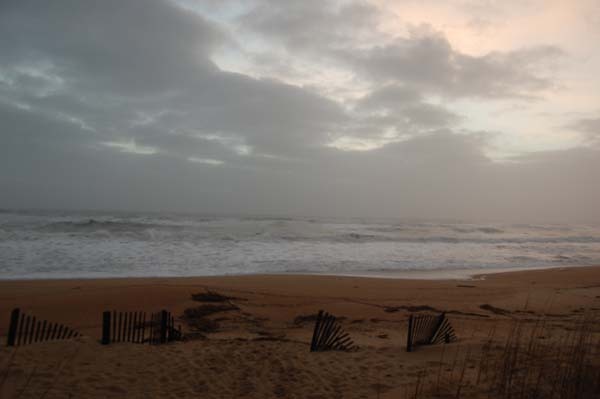 KILL DEVIL HILLS, N.C. — I write this—longhand, as always—with frozen fingers. I have been chasing the sun for nearly two hours. We told the baby we were going to see the Big Water, but when we finally arrived in the Outer Banks it was already dark. It’s a very dark dark here, and though we stood on the beach we could make out just the barest shape of waves reflecting the moon. The sound was incredible, angry, reverberating in our chests. That familiar salt-fish-sand smell blew past and through us. We were back at the seashore before 6 a.m. We had a blanket under us and two around us, over our winter coats, with just our hands peeking out to hold coffee and tea. It was 6C, but frigid with the ocean wind on our cheeks. Cloud cover and fog meant the sunrise wasn’t as spectacular as it might have been. Except that we were bundled up in the sea air and we were talking to the sun and staring at Venus and we were together. And that, my friends, is rather spectacular. It was so cold! But there is no snow and the sound — omigod, Lu, that sound of the Atlantic Ocean. There is nothing like it on earth. Beautiful picture! Sunrises on the Outer Banks are great sights. Thank you, Susie. It is one of the most beautiful places on earth — you’re awfully lucky to live in the area.